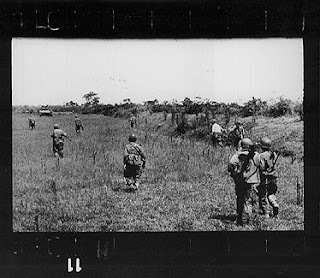 May 25th, 1954 Last roll of film, the road to Thai Binh. This was the last black and white frame Robert Capa shot. With his next footstep he detonated a land mine. This is an online version of the monumental photo book Requiem. The audio clips are missing sadly, this would have been incredible to listen to, especially from those who were there in-field. I'm going to try and contact these guys and see if they would make the audios available again, but it seems the site is a bit out-dated and in much need of an overhaul.